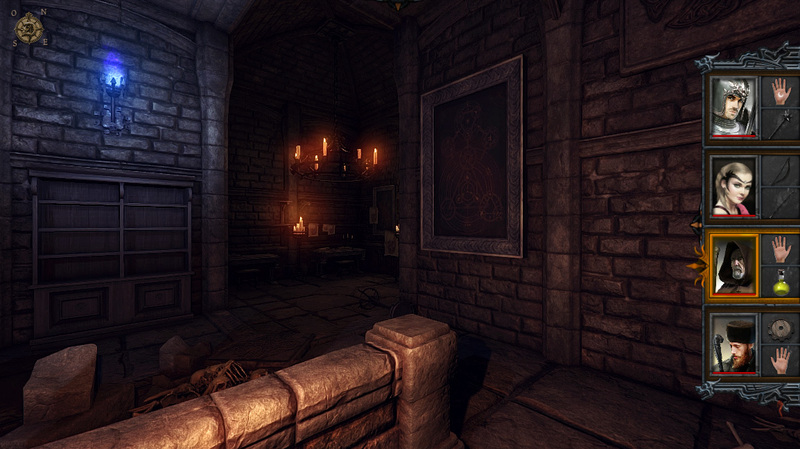 It’s time for an update on Dungeon Kingdom: Sign of the Moon’s progress. – First of all, we adjusted and in some cases simplified the core rules system to make character evolution clearer for players. All parts have been tweaked, such as character evolution, experience gain, damage, etc. -Priest spell casting has changed: Now priests do not need Mana to cast a spell. Priest get their power from their devotion to Adwij. You can cast any spell if the hero has the right level to do it. Then, a cool down appears before you can cast that spell again. -We now allow players to look around on the automap, it’s no longer locked in place. -Health Points are now Body Points, and Mana is now Spirit/Mind Points. While Body Points don’t really change the game, the notion of Spirit Points allows for some new mechanics such as a new kind of attack: the Psionic Attack. Any character with no Spirit Points will lose the ability to perform actions, including physical ones, as their brain is in a paralyzed-like state. -New spells and new items have been added. -Better visual feedback when you get hurt, gain new levels etc. We’ve also added the gauges when you’re sleeping. -The game is now paused when reading a book/scroll. -You can now switch around the character’s positions. Front characters can now become back characters and vice versa, at any time. -Added the ability to use items to cast spells, such as scrolls and staffs. -Some other new features were added, but we’ll let you discover them whilst playing, so as to not spoil too much as it could ruin the surprise! The next update will contain all the features mentioned above, but we’ll take some more time to test them all. On the Level design side, we keep adding new levels, and we care about creating a lot of content for all the areas and not simply always reusing the same graphical elements. This is of course time consuming and we want to thank you all for your patience. We don’t want sacrifice any content by rushing to push out levels that we are not satisfied with. This is why we have decided to schedule the full release for after the summer. Holidays are coming quickly, and instead doing the final release when many of our players are away, we’ll wait until after the summer and take that time to polish the game. Stay tuned for the next game update, we’ll push it on to Steam soon! ← Dev Update and new screenshots! Donate to help us fund the game. Every single donation will help! We offer a digital copy of the game for any donation of 15 euros or above.